What makes Pinnacle different? It’s what you don’t see, the patented Helical Worm Gear and reinforced Nylon Polymer Gear Rack. This innovative drive system eliminates maintenance, provides you savings with lower energy bills, and delivers a smooth, stable ride you can rely on. 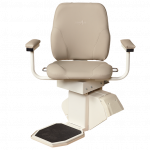 Although exceptionally compact, Pinnacle boasts a 350 lb capacity with a wide, comfortable seat that swivels at the top landing to aid in safely entering and exiting the lift. Safety sensors prevent the lift from running if the seat is not in the proper position or if something is blocking the stairway or track. Harmar’s exclusive automatic and mechanical folding rail eliminates a trip hazard at the lower landing area. Its operation is automatic, the user does not need to stop or have someone else assist. And since it’s mechanical, there are no additional switches or controls. Narrowest stair lift in the industry – folds as narrow as 10.5” when footrest and seat are folded!